Patrols at the US-Mexico border have caught a record number of illegal immigrants who crossed through multiple tunnels under the steel border fence near San Luis, Arizona. Almost half those apprehended are minors. US Customs and Border Protection reports they have apprehended 376 illegal aliens, including 179 children – a record total for a single group – after the migrants entered the US earlier this week through seven tunnels dug by smugglers under the fence separating San Luis, Arizona from San Luis Rio Colorado, Mexico. While most passed through the tunnels, a few climbed over the barrier. 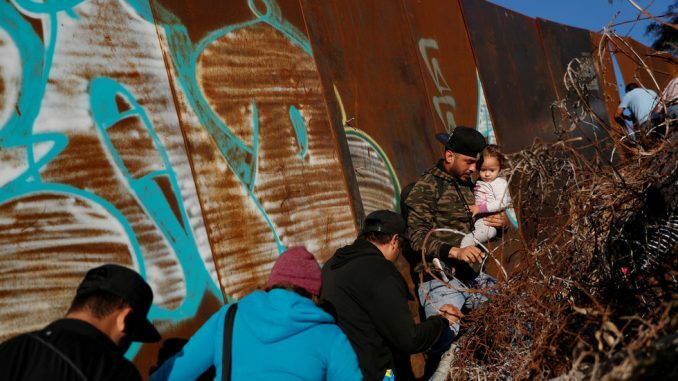 The new arrivals turned themselves in to authorities without incident, and the US Customs and Border Protection Agency tweeted multiple photos and videos of the migrants waiting to be processed. Thirty-one of them were unaccompanied minors. “In my 30 years with the Border Patrol, I have not been part of arresting a group of 376 people,” said Border Sector Chief for Yuma Anthony Porvaznik, calling the huge group “unheard of.” He said the biggest challenge the Yuma patrol faces is the “humanitarian problem,” explaining that 87 percent of those apprehended are families and unaccompanied minors, and asked for better barriers along the border. “It’s the largest [group] I’ve ever heard of,” National Border Patrol Council President Brandon Judd agreed, noting that the “vast majority” were family members who had come from Guatemala. Children have made up a large percentage of those detained at the border ever since migrants learned that adults traveling with kids must be released within 20 days, according to Border Patrol spokesperson Jose Garibay. “They know the loopholes in our immigration system and they know how to exploit it, and that’s what they do,” Garibay said. It is unclear how closely the rest of the Yuma wall’s design resembles that which President Donald Trump is determined to build along the unfortified sections of the border. The tunnelers are the second large group to turn up at the border this week. Another 247 Central American migrants turned themselves in on Wednesday at Antelope Wells port of entry in New Mexico.